In 2016, the United Nations reported that Israel demolished or seized some 1,089 Palestinian-owned structures throughout the West Bank and East Jerusalem, displacing 1,593 Palestinians and affecting the livelihoods of another 7,101, the highest number since 2009. 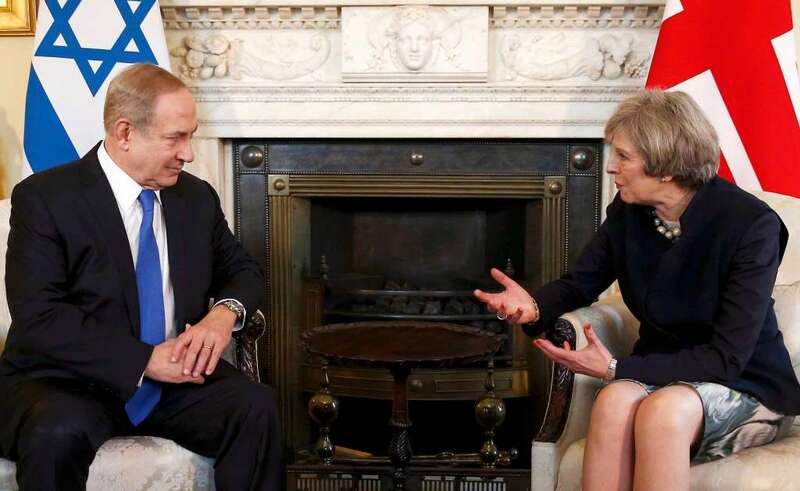 Theresa May welcomes Benjamin Netanyahu to Downing Street today, just days after the Israeli Prime Minister announced plans for thousands of new illegal settlement units in the West Bank and East Jerusalem. The UK Government’s contempt for the rights of Palestinians is clear. The meeting raises serious questions about the UK Government’s commitment to its obligations under international law, and its willingness to promote and enforce even its own policies regarding Israel and the Palestinians. If May followed the rules of her own government, she would slap an arms embargo on Israel, not roll out the red carpet for its leader. The expansion of illegal settlements in the West Bank and East Jerusalem has now become the topic of an Israeli government announcement every few months. It was the intensification of settlement expansion that led the UN Security Council, including the UK, to vote for a resolution condemning settlements in December 2016. Settlement expansion, considered a war crime under international law, is not only about building houses for Israelis. It is accompanied by land seizures and demolition of Palestinian homes, making way for settlement and “security” infrastructure. In 2016, the United Nations reported that Israel demolished or seized some 1,089 Palestinian-owned structures throughout the West Bank and East Jerusalem, displacing 1,593 Palestinians and affecting the livelihoods of another 7,101, the highest number since 2009. Land seizures and demolitions affect Palestinian citizens of Israel also. Just a few weeks ago, Israeli authorities demolished homes in the Palestinian Bedouin village of Umm al-Hiran, in southern Israel, to make way for a new Jewish village. When Palestinian residents protested the bulldozers pummeling through their homes, a local teacher was shot dead by Israeli police, who then branded him a terrorist amidst disputed claims he had deliberately driven his car at officers, killing one. And what about those around the world who are standing up for Palestinian human rights? Boycotts and divestment campaigns are vital to ending government and corporate material support for these crimes, yet because of the growing strength of the movement for Boycott, Divestment and Sanctions (BDS), it has been singled out as “enemy number one” by the Israeli government. The Israeli Ministry of Strategic Affairs has set up a special “task force” to combat BDS activities around the world, its emissary caught on camera calling for a “take down” of UK MPs critical of Israel. And right now a new anti-BDS bill pending approval in the Israeli parliament will mean anyone associated with the movement can be banned from the country. Will these be the topics of discussion between May and Netanyahu? We don’t know. What we do know is that while the UK Government has expressed concern about Israel’s violations of human rights, it continues to approve millions of pounds worth of arms and weapons technology exports to Israel each year. Government rhetoric once again masks a more sinister reality. The UK’s own procedure for determining the legality of exports has identified Israel as a country of concern, with it violating numerous points on the criteria for receiving arms exports. Yet still, over £100m arms exports were approved in 2016 alone. The armed drones, military aircrafts, assault rifles, grenade launchers and more continue to leave British ports destined for use in the repression and killing of Palestinians, whether citizens of Israel or occupied subjects. Rather than deepening the UK's relationship with Israel’s human rights abusing government, it’s time Theresa May reminded herself of the UK’s obligations under international law, which if enforced, would block her Government from approving arms exports and other trade that lends material support to Israeli violations.